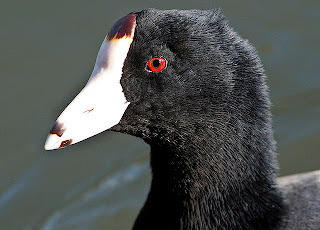 Real Monstrosities: Bald as a Coot. More so, in fact. Wow! I thought I said no vultures? With its black skin and a beak that looks like a matte black knife you might think that the Noisy Friarbird is some gluttonous carrion eater or vicious killer. Maybe the picture has cropped out the Dark Knight of the Circle of Cosmic Deathterror upon whom's shoulder this bird is perched. With its red eyes, scraggly beard and carefully sculpted eyebrows it looks like a friar, sure, but an Evil Grim Necro Friar From Hell, messenger of the Lower Gods. 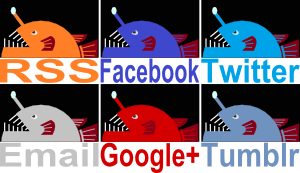 The Crimson-eyed Heralds of the Order of the blah, blah, blah. It's actually a honeyeater. They eat nectar, insects and fruit. It just so happens they aren't quite as cute and attractive as so many of their relatives. They come from New Guinea and east Australia, which is a lot more clement than west Australia. The ones in the south still fly north in the winter, though. I suppose that's what happens if you're that close to Antarctica. They reach about a foot in length so neither can they block out the sun with Wings of Unending Shadow or even Thoughts of Ironically Unimaginable Hate. I still have my suspicions, though. 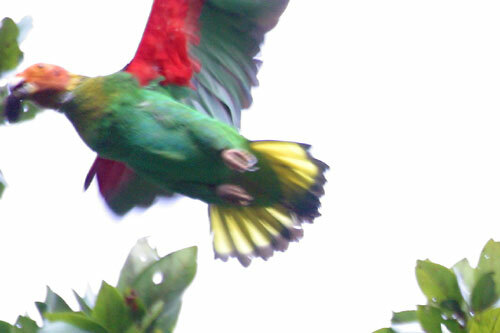 The Bald Parrot is aptly and succinctly named, immediately telling the world two vital, unambiguous facts. What it doesn't tell you is that despite being pretty large and colourful if not quite pretty, it was only described in 2002. 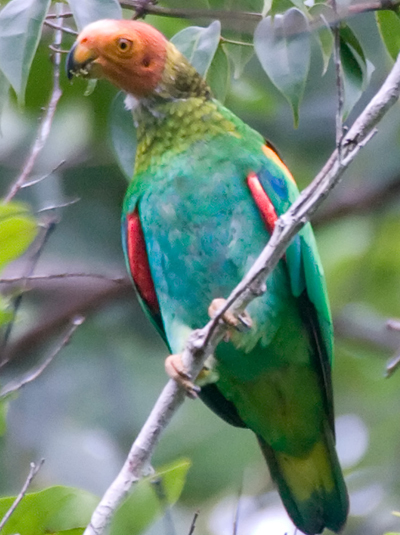 It comes from the Amazon and despite having already been spotted, it was thought to be a young Vulturine Parrot. This despite looking somewhat different from Vulturine Parrots and even looking different from the young Vulturine Parrots that people had already seen and collected. Whoops! Someone finally checked it out and realised that these Bald Parrots were in fact responsible adults and not a young anything. A friend to flamboyance, they also have a lovely flash of red beneath their wings to go along with all the other colours. Unfortunately, nothing can hide that bald head. Feathers could, they just don't. And that's the problem. 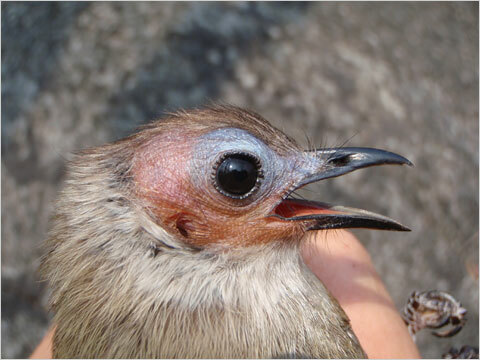 The Barefaced Bulbul is an even more recent discovery. While it was glimpsed in 1995 by a researcher who was probably left mostly puzzled and then teased by disbelieving fellow researchers, it was finally spotted in Laos and collected in 2009. They were 100 miles away from the previous sighting and they seem to be restricted to dry, limestone areas with shrubs and less than grandiose trees. I'm sure the best part was the original researcher raising his hands in triumph, shouting "I told you so!" to increasingly wearied colleagues. What a difference 15 years can make. To me, it looks like the Barefaced Bulbul agrees with that sentiment. Probably more 15 weeks, though. With it's pink face and blue around the eyes, it actually looks a bit like a newly hatched chick. Plastic surgery is going way too far. Wood Storks are huge! They can get over 1 metre tall with a wingspan of up to 1.8 metres, which allows these massive creatures to fly. Their plumage is entirely white except for some black tail and wing feathers that are hidden when on the ground. 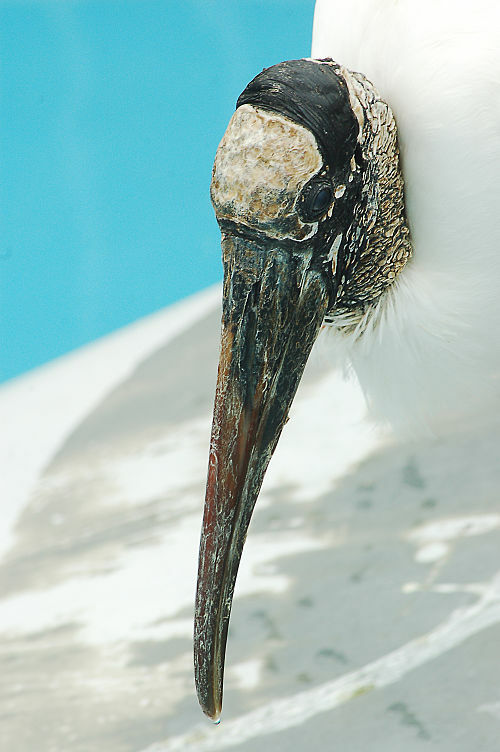 This means that from a distance, Wood Storks look like beautiful, clean birds with a nasty growth sticking out the top. This growth is actually the head and neck. At best it looks something like a tree covered in crusty, white lichen, but it might look more like the crusty, white symptoms of some appalling disease. It's not though. These storks can be found in lots of different areas of South, Central and North America, snapping up fish and frogs even if their beak looks like it could just crumble away at any moment. The hilariously tiny headed Vulturine Guineafowl is also bald. Or does it have a seriously receding hairline? Featherline? It's actually quite pretty, with its vibrant blue breast, the mesmerising spangles of the rest of the body, the lovely long feathers that seem to flow seamlessly from the long, bare neck upon which is perched a tiny head. The head is so tiny that the blood red eye has to be similarly tiny, like some tiny jewel, and the bill, while it looks tough, is also tiny because of the tiny head. They eat seeds and little insects in northeast Africa, probably all the time because their head is so tiny. Not everything is so tiny, though. These guineafowl have long legs to run away from stuff and short (not quite tiny) wings for flight. It sounds like they're big at the bottom and then taper away as you go up, culminating in an incredibly tiny head. Oh, man. If the Vulturine Guineafowl was a sauropod then this is one of those Deinonychosaurian raptor ones. It's also known as the Hermit Ibis, and it looks like just the kind of thing that would be a hermit. It also has another name: the Waldrapp, which comes from the German for "forest raven". It is indeed entirely pretty much black but more of a metallic green sort of colour, with tufts sticking out from the back of the head in a manner that would be funny if it wasn't so sinister. Though an ibis, this is not a wading bird. No, it prefers barren landscapes and rocks. Though a "forest raven", they also don't nest in trees. No, they much prefer cliffs and rocks. Just as you'd hope, this is a meat eater which feasts on lizards, mammals, birds and various insects and such, plucking them up with a beak that looks for all the world like it's soaked in blood. This bird was once found in southern Europe but disappeared from there more than 300 years ago. It wouldn't surprise me if they were all burnt at the stake. Populations in the Middle East have also plummeted. At one point it seemed like the only ones left were in Turkey. Specifically, there was a stable population of 500 breeding pairs around a town in the south east of the country. The locals protected them since they believed their yearly migrations served as a guide to pilgrims on the way to Mecca during the Hajj. Unfortunately they all died out in 1992, having seen their numbers plummet from the 70s onwards. During this whole time there were still reports of sightings of the Waldrapp in other parts of the Middle East and, in 2002, nesting sites were discovered in Syria. It seems that this country is host to a bit under 10 of them. 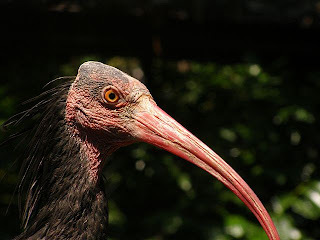 While they were also once widespread across North Africa, the Northern Bald Ibis' main stronghold today is Morocco, where there are some 500 individuals. We all know that storks bring us babies but, since we must all also accept the inevitability of Death, there are ongoing attempts to keep this bird going, with new breeding sites set up in various parts of its old range. Here's hoping it works out. Cute and cuddly birds are great, so are the majestic ones and others that command respect, but we need all the sickly, disquieting ones, too. Even if it has face that looks like it would gladly cut a man in half and a beak that looks like it already has. A fine group of "monstrosities" today. I found the vulturine Guinea fowl quite pretty. Thank you! 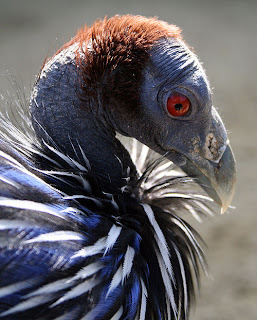 I find the Vulturine Guineafowl quite pretty, too. You have to admit though, it really does have a remarkably tiny head. Awww, leave the poor vulturine guineafowl alone. You know why he looks so sad? Because SOMEONE keeps making fun of his head, which I am sure is the perfect size for being a vulturine guineafowl (with a really tiny head). Hahahahaa! Whoops! I feel ever so slightly guilty now! I'm sure he can find solace in his lovely, lovely neck feathers. I hope so, anyway.